Throat Chakra is the fifth chakra in the 7 chakra system. It corresponds to the third cervical vertebra just below the medulla oblangata. In sanskrit this chakra is called Visuddha, which means PURE. It is described as PURE because it transforms the life force coming from the lower chakras to the upperchakras as unconditional love and joy. This Chakra governs the area from the base of the nose to the base of the throat. It regulates self-expression which includes feelings, emotions, ideas and creativity. Most people get heart attacks not because of blocked heart chakra, but because of throat chakra. Yes its’s true that Heart chakra creates cardiac arrests but this chakra prompts the heart chakra.When the Throat Chakra is weak, the individual is unable to express his feelings and those feelings are pushed down to the heart causing energy congestion at the heart leading to a cardiac arrest. 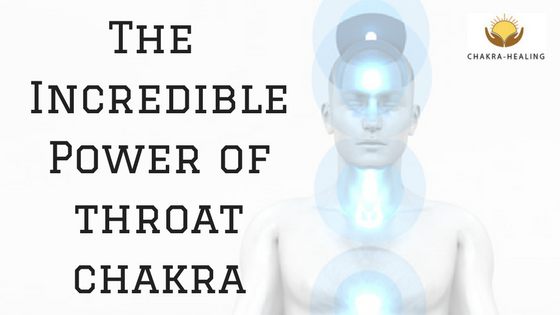 If Throat chakra is active and balanced, it gives you the power of expression. The expression can be in the form of Singing, Painting, Writing, or Speaking. If you come across someone who talk too much, know that their Throat chakra has become over active and out of balance. If you come across someone who doesn’t talk much, Know that their Throat chakra is blocked. A weak Throat Chakra is the reason people become INTROVERTS. Especially If you find your children weak in this area then you know the reason. Sometimes kids take little longer to speak or they speak early than the rest, because of slow or fast development of this chakra. Also If we restrict children from expressing themselves then this chakra gets blocked forever, since it will be at a developing stage. Every time I am on stage or conducting a workshop or dealing an important negotiation I always POWER UP my throat chakra. This helps me access its power in better self-expression, fearless speaking and be creative. Your thoughts are processed at crown chakra. When they reach third eye chakra, you will analyse and reason with them.But because of your psychological profile if you cannot communicate or express then they remain inside the chakra as un expressed thought forms. These thought forms over a period of time blocks the energy flow between lower and upper chakras. This block leads to imblance in the Throat Chakra. When your crown chakra absorbs cosmic energy and inspires you to create something in the field of art or music or peotry but because of your laziness, you won’t transform that energy in to something tangible through your throat chakra. Over a period of time they cause so much of energy congestion that they will not allow energy processing at the throat chakra level. How can you activate this chakra ? You don’t need to be an Energy healer to activate this chakra. Here are simple and powerful 7 ways you can activate this chakra. Speak about something that you have been silent about. If for any reason you cannot speak the truth, then start writing a Journal. Wear a lighter shade of sky blue – A scarf or a necklace or a shirt. Look up to the blue sky and Imagine the colour on your throat. What If the chakra is Overactive ? Avoid finding faults and stop micro management. Stand on the ground with naked feet for Ten minutes everyday. Avoid salt as much as possible in your food. Do fasting once a week. Fasting means have only fruits for that day. balances the Throat chakra. Listen with your headphones and balance the Chakra. This meditation has to be done for 40 days without a break. For any reason you miss one day then you have to start all over again. Don’t under estimate this meditation as it is very simple, what is important is it gives you results. Now while closing your mouth create the sound Mmmmmmmm while exhaling. If you are interested in chakra balancing meditation, then I have a course on three important meditations. You can follow the Instructions on the audio. As always I can go only so far in offering general advice on healing your chakras but, If you want to join me in private consultation and further explore your chakras, I’d be thrilled to develop specific strategies that work perfectly with your health, weaknesses and strengths to get you feeling better… and faster. Sign up for one of my private consultation plans and let’s connect today !! Let me know what you think of this blog post and any questions you may have by leaving comments below. I will practice from to day. I came to know various things related to chakra meditation and healing techniques. Hope other will like this post. Thanks.